In a saucepan, heat the olive oil over moderate heat and once hot, add the garlic and cook stirring, until pale golden. Add the broccoli, salt, sun-dried tomatoes and red pepper flakes and cook, stirring, for 2 minutes. Add the chicken broth and simmer for 5 minutes or until the broccoli is tender. Meanwhile cook the pasta and transfer it to the saucepan. Toss to combine and serve topped with cheese. In Recipes-list.com we have selected the most viewed recipes from category - uncategorized . Enjoy the best recipes specially selected for you! 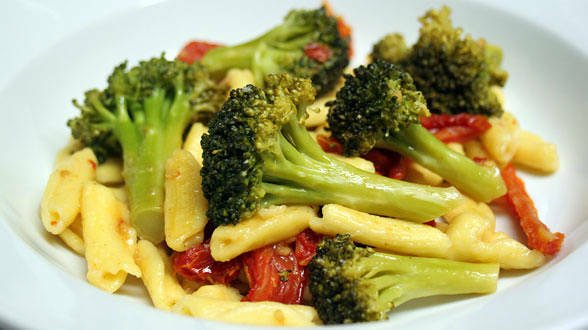 Cavatelli with Sauteed Broccoli, Garlic, and Sun Dried Tomatoes is the right choice that will satisfy all your claims.